A 23-year-old Indian entrepreneur today announced release of the Tezaa Project (http://www.tezaa.com), that searches perceptions and opinions. Designed and developed to facilitate decision making and occasionally substituting conventional web search, Tezaa lets people create polls and vote, to collectively form social wisdom. "It's like being in the crowd and knowing their minds too" said Shalin, one of the two developers at the project. "If you were to buy an mp3 player or choosing an hotel for your next travel destination, peer feedback can play an important role in your decision-making process. Everyone likes to get first-hand reports and opinions from others" added Shalin. Highly inspired by New Yorker columnist James Surowiecki's book 'The Wisdom of the Crowds' Tezaa Project aims at generating social wisdom that will give back to the society. Tezaa essentially lets anyone post questions as polls and get opinions from other users on the tezaa community. Polls can be posted on any topic including technology, politics, travel, sports, education, social issues and many others. Unlike traditional forums and question-answer communities on the web, Tezaa banks on objective and summarized information, which is quick and easy to assimilate. Based on an open content concept like wikipedia, Tezaa depends largely on user-created and moderated content, including features that allow any user to add a new choice to an existing poll. Tezaa makes it very easy for any one maintaining a website or a blog to add polls to their web pages. It also lets users invite their friends to a specific poll, making it quick to gather opinions from people you already know. Tezaa is a largely search based and information is organized by Tags or Keywords. "If you were buying a car and were confused by the choices before you, the Tezaa community provides the best and the quickest results. It beats conventional web search which demands that you read a lot reviews and comparisons before you finally find the answer." remarked Shalin. Tezaa adds to the growing list of user-driven web 2.0 services like Digg, Wikipedia, del.icio.us that an offer effective platform for information sharing while benefiting the society at large. Anyone can sign up and start participating by creating an account at http://www.tezaa.com. Membership is free and the service is ad-free. Tezaa Project is online community that is driven by polls and powered by search. It aggregates public perception and opinions allowing everyone to benefit from information sharing. Started by two employees at Tenmiles Corporation, a small software company founded by Shalin Jain and based in Chennai, India. The project is currently funded by the company and is aimed to remain an ad-free project. 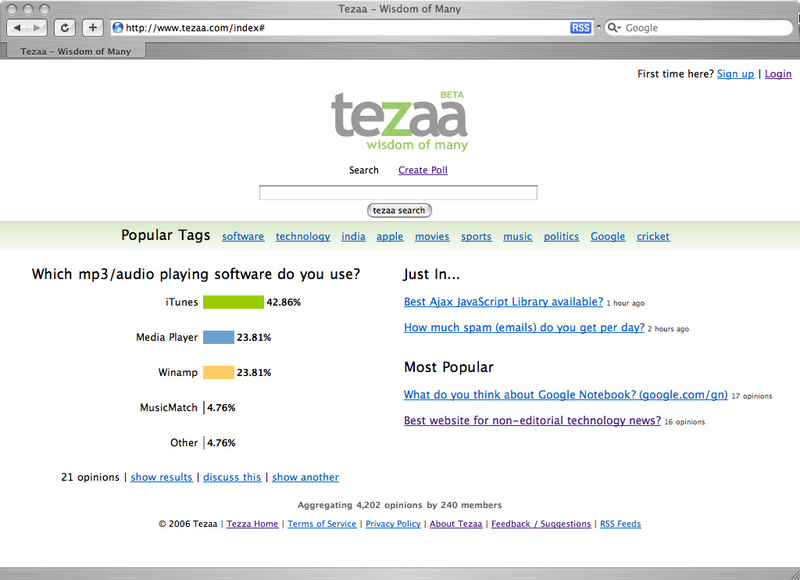 Tezaa - Wisdom of Many - Online Polling ServiceScreenshot of Tezaa homepage.